Superman is tough to write for. He's just too strong and too tough to write good plots around  those big muscles tend to break down any nuanced or believable plot-mechanics, and he's too morally rigid to be interesting or relatable. But writer Morrison seems to get what's fun about Superman: He's ridiculously powerful, and therefore he just sees and does and has lots of incredibly cool, totally bizarre stuff. 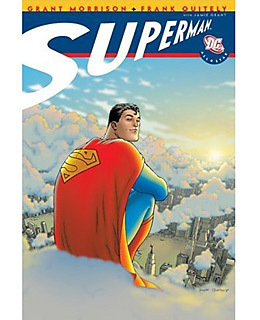 All Star Superman isn't bound by DC-universe continuity, so the sky isn't even close to the limit: time machines, nanonauts, sun-eaters, a super-dense sphere of black kryptonite from the Underverse, it's all good.